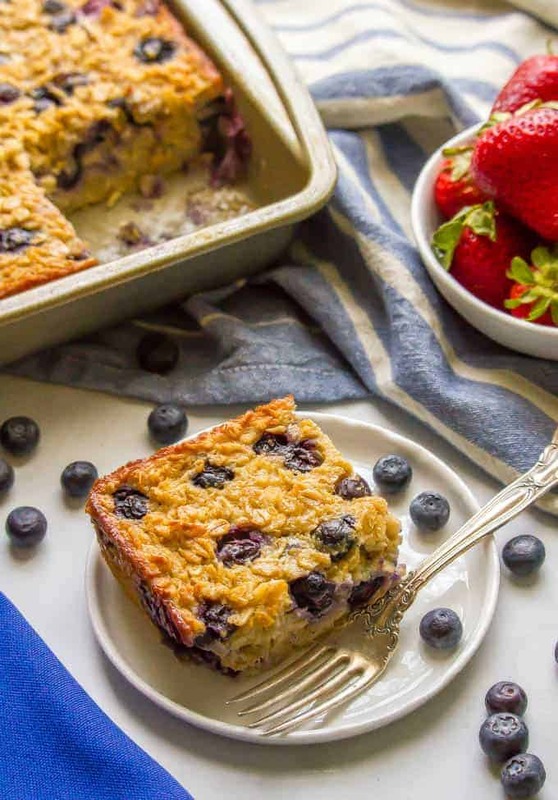 Blueberry baked oatmeal is a bright, fresh and healthy breakfast that’s bursting with fresh sweet blueberries. 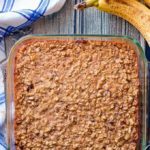 Naturally sweetened and gluten-free, this makes a great make-ahead breakfast to have on hand for busy mornings. Happy, happy morning my friends! We are in week one of having a nanny coming in the mornings for summer break and it has been so wonderful! Normally, we’d be rushing around to get the kids ready and off to camp – and pick them up midday – and instead, they’re able to just play in the mornings and hang out. It seems so much more relaxed! And it has me excited for a more relaxing summer overall. And now it’s time for breakfast! So you know we love baked oatmeal at my house right? 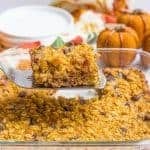 Banana bread baked oatmeal was our first love, but we also adore my carrot cake baked oatmeal and in the fall, it’s all about my pumpkin baked oatmeal with chocolate chips. 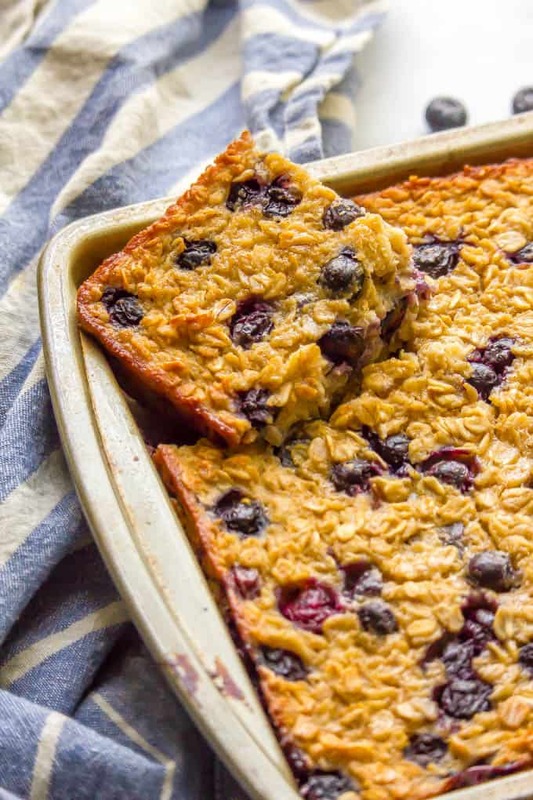 This healthy baked oatmeal is whole grain, gluten-free and naturally sweetened with maple syrup, which is a great flavor to pair with those gorgeous blueberries. 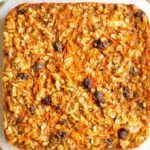 It’s one I love to make ahead, usually over the weekend as part of some light meal-prepping, so it’s ready to go on busy mornings. The batter is very liquidy and it will fill your pan almost all the way. Don’t panic, that’s just how it should be. 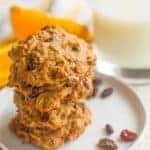 The oats absorb that liquid and this doesn’t rise, so it’s not going to spill over. It’s helpful to let this cool for a while in the pan before you slice it so it doesn’t get too crumbly. 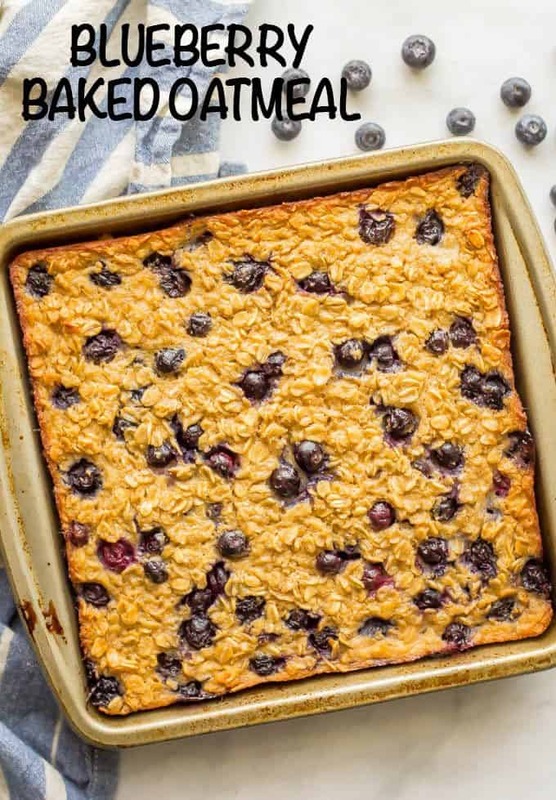 You can add in 1/2 cup slivered almonds or sprinkle them on top if you love a blueberry-almond combo like I do. My kids aren’t fans of nuts mixed in or I would do that regularly. Serving this for brunch or a special occasion? You could add a drizzle of lemon glaze to dress it up a bit. This can be stored at room temperature, covered, for 2 days. After that it’s best stored in the refrigerator so it doesn’t get soggy. We love it cold but you can also rewarm it in the microwave. It also freezes great. I place the baked oatmeal squares in a labeled freezer plastic bag and it’s good for up to 3 months. Wishing you lazy summer mornings of laughter, lounging in PJs, coffee refills and fresh fruit-laced breakfasts like this one. 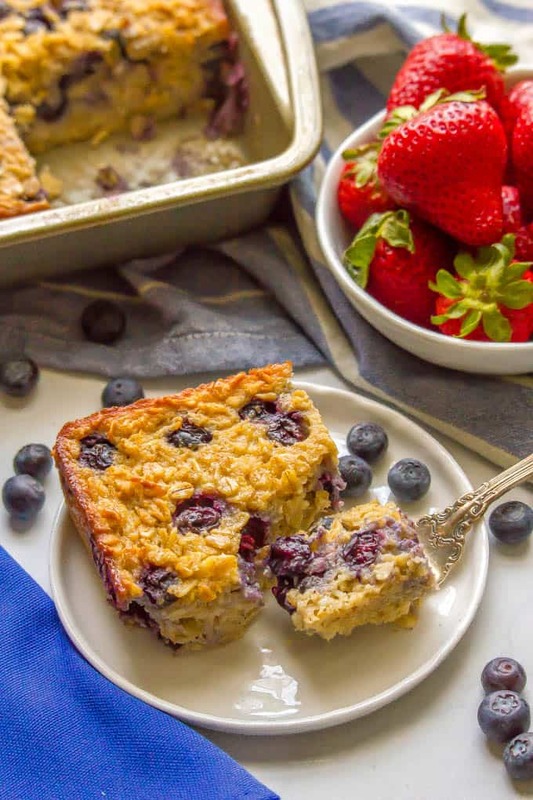 Blueberry baked oatmeal is a bright, fresh and healthy breakfast that’s bursting with fresh sweet blueberries! In a large bowl, combine the oats, baking powder, cinnamon and salt. 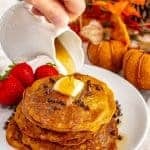 In a medium bowl, whisk together the egg, milk, Greek yogurt, applesauce, maple syrup, melted butter and vanilla until smooth. Add the wet ingredients to the dry ingredients and mix well. Carefully fold in the blueberries (so you don’t break and burst them). Transfer the batter to a well greased 8x8 pan. It will be very full and liquidy. Bake at 375 for about 35 minutes, until the edges are browned and the middle is set. The batter is very liquidy and it will fill your pan almost all the way. Don’t panic, that’s just how it should be. 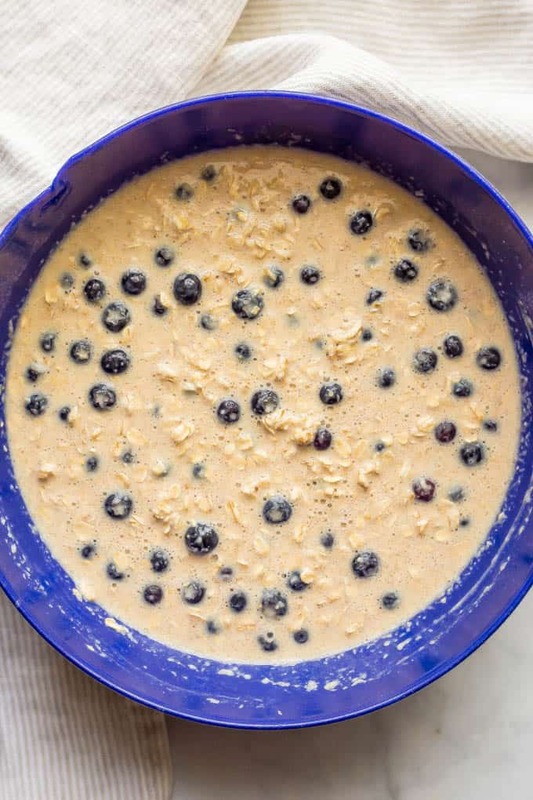 The oats absorb that liquid and this doesn’t really rise, so it’s not going to spill over. 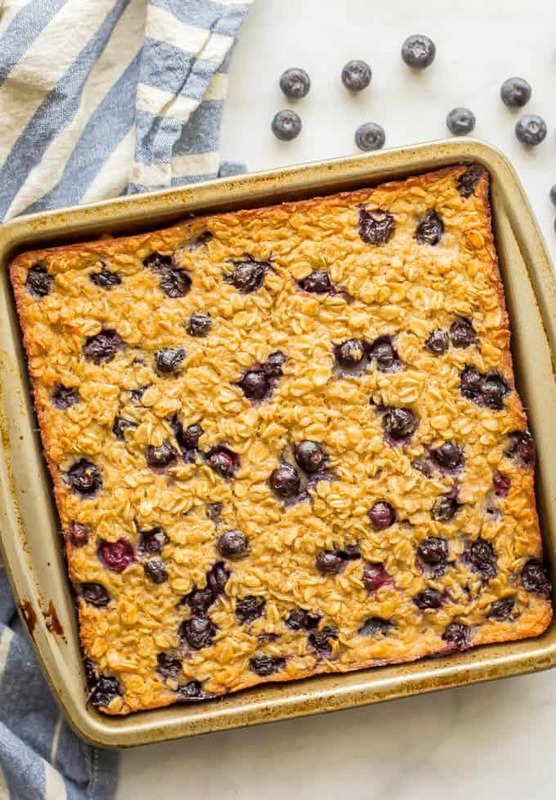 You can add in 1/2 cup slivered almonds or sprinkle them on top if you love a blueberry-almond combo. You could add a drizzle of lemon glaze to make this extra special. Kathryn, what a delicious recipe! Used oat milk, that’s all I had, will use coconut milk next time. Will be making it again today, to share with family. Rave reviews at potluck yesterday, it disappeared off the table so quickly, some guests went back for seconds. Love your recipes and they never fail. Amazing dessert, thanks for the recipe! Hi Katie, yes, I think that should work fine! I often sub honey for maple syrup and vice versa in baking and it always turns out fine. Would love to hear if you try it! Made this today, Used honey instead of syrup. After baking for almost 45 minutes The center still really gooey and just falling apart. I cut it after sitting for about 10min and let it sit for about 15 minutes before trying to take it apart and it just keeps falling apart any suggestions? I’m sorry you had trouble with this Melissa! Just the honey substitution wouldn’t make much of a difference so I’m wondering if all the other ingredients and measurements were accurate? The batter is very liquidy but it sets up in the oven as the oats soak up all the liquid. It may be a little crumbly after you bake it but it shouldn’t be gooey at all. I measured everything our carefully. I’m trying it again tonight. Going to cook on convection see if that helps. My oven can be finicky. I also use a glass dish. Pint of blueberries. Has anyone tried it with a different fruit? Perhaps strawberries, cranberries, etc? What about using apples? I really liked the blueberry, but wanted to try apples. Can I use the same ratio of apples to blueberries? How much cinnamon? 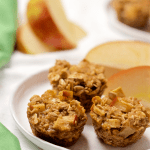 I love the idea of a cinnamon apple baked oatmeal! I’ll have to start playing around with that, because it would likely require a few changes to adjust for the consistency/sweetness. And it could probably use at least double the amount of cinnamon. But do let me know if you try it!